eCite - Interprofessional Collaboration - Can Malaysian Pharmacists Expand their Non-dispensing Role in Osteoporosis Screening and Prevention? Interprofessional Collaboration - Can Malaysian Pharmacists Expand their Non-dispensing Role in Osteoporosis Screening and Prevention? This study describes the perspective of nurses, pharmacists, doctors and policy makers regarding the integration of the non-dispensing role of pharmacists in osteoporosis screening and prevention at the primary care level. 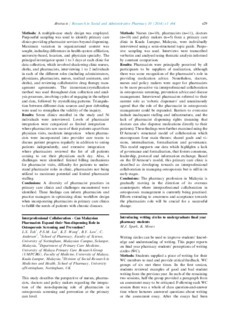 Methods: Nurses (n�), pharmacists (n�), doctors (n�) and policy makers (n� from a primary care clinic in Kuala Lumpur, Malaysia, were individually interviewed using a semi-structured topic guide. Purposive sampling was used. Interviews were transcribed verbatim and analysed using thematic analysis informed by constant comparison. Results: Pharmacists were principally perceived by all participants to be suppliers of medication, although there was some recognition of the pharmacist抯 role in providing medication advice. Nonetheless, doctors, nurses and policy makers were eager for pharmacists to be more proactive via interprofessional collaboration in osteoporosis screening, prevention advice and disease management. Interviewed pharmacists referred to their current role as 憆obotic dispensers� and unanimously agreed that the role of the pharmacist in osteoporosis management could be expanded. Barriers to overcome include inadequate staffing and infrastructure, and the lack of pharmacist dispensing rights (meaning that doctors can also dispense medications directly to their patients). These findings were further examined using the D扐rmour抯 structural model of collaboration which encompasses four main themes: shared goals and visions, internalisation, formalisation and governance. This model supports our data which highlights a lack of governance and formalisation, that fosters consensus, leadership, protocol and information exchange. Based on the D扐rmour抯 model, this primary care clinic is described as developing towards an interprofessional collaboration in managing osteoporosis but is still in its early stages. Conclusions: The pharmacy profession in Malaysia is gradually moving in the direction of its overseas counterparts where interprofessional collaboration in osteoporosis management is currently being practised. Efforts extending to awareness and acceptance towards the pharmacists role will be crucial for a successful change.